05 feb 2019 :- Aaye Kailasa Prayagraj Maha Kumbh is not only the biggest effort of all the devotees who have come upon Kumbh till now, but this Bhajan by the inspiration of Dakshineshwar Kali Pithadishwar Mahamandaleshwar Kailashanand Brahmachari Ji and inspirational interlude to Cosmic revival, this bhajan is created by Dr. Ajay Magan In the musical direction of Bollywood composer Dushyant Singh, on the other hand playback singer Padmabhushan Mr. Udit Narayan used his voice , playback singer Menka Mishra and Dushyant Singh has converted it into a great musical presentation. 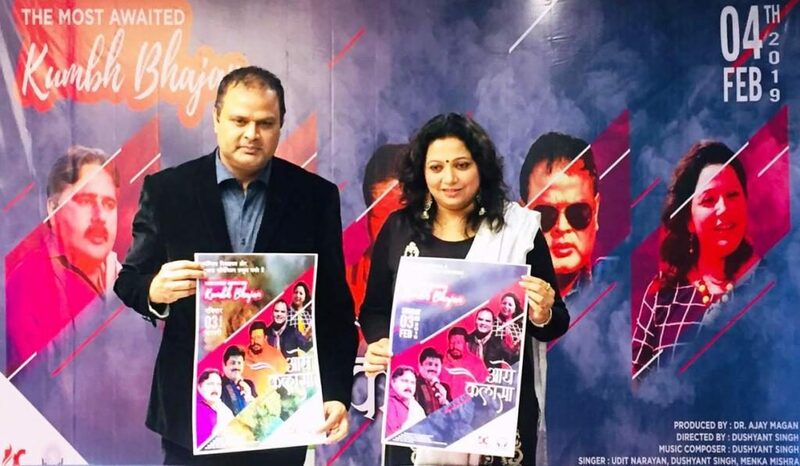 Bhajan is written by Dr. Ritu Singh and it has been directed by director Dushyant Singh. It has been filmed on the location of Haridwar, Prayagraj, and Mumbai. Because filming on the location from the east to the west and the Aquarius theme, this Kumbh Bhajan also actively establishes the union in the East and the Kumbh of the bhajan. The above-mentioned bhajan has used cutting-edge technology and equipment during recording and shooting so that this leaves an impressive impression on the interactive platform. According to Dushyant Singh, personal efforts will be made to spread the publicity of this bhajan and to make it accessible to the masses. This entry was posted in Entertainment, Launching. Bookmark the permalink.